The American government is a Representative Democracy; we elect officials to the branches of government who then enact laws and, as a result, create departments and agencies who develop their own policies and methodology based on the direction of their branch head. It would be virtually impossible to have a Direct Democracy utilizing the traditional participatory methods; voting on every issue that came before Congress, individual polling, community meetings for direct input on every issue for every department and other similar impossibilities. Over the years various tools have been implemented to give the citizenry more direct access to government. This includes sunshine ordinances for access to information, ballot initiatives, propositions and recall elections. This has been especially true in California, there is an excellent story from April 18th on NPR related to this. It appears that the most recent tool set to integrate the citizenry in the business of governing is social media. According to Wikipedia, a Web 2.0 collaborative tool for information sharing, social media is “a term used to describe the type of media that is based on conversation and interaction between people online. Where media means digital words, sounds & pictures which are typically shared via the internet and the value can be cultural, societal or even financial.” (http://en.wikipedia.org/wiki/Social_media) Today social media is absolutely necessary in marketing, outreach strategies and campaigning; it is a series of tools that makes the jobs of gathering data about target demographic, spreading information, analyzing trends, and communication in general easier than it has ever been. Mashable, one of the largest blogs on the net relating to internet news and social media recently came out with an entry by Alexander B. Howard, the Government 2.0 Correspondent for O’Reilly Media called “5 Ways Government Works Better with Social Media” and while this is not a comprehensive list of all the ways that social media can be used to increase the effectiveness of participation, outreach and information spreading, it lists five specific examples of where social media has already been used in these areas. The article discusses social media’s effectiveness in communication to the public about emergencies, disasters and efforts to deal with them by citing the examples of the information outreach for the Gulf of Mexico Oil Spill and Twittering for Storm Reporting. In San Francisco there are already web and phone applications used for similar purposes from receiving smart phone updates regarding the Muni schedule to earthquake preparedness. The article goes on to speak how social media has helped various agencies communication internally and with other agencies and how it has enabled the outreach and development of social programs through crowdsourcing; basically outsourcing through the internet or to a large community. In most instances crowdsourcing is used for information gathering or spreading but in this specific case it is used to promote a contest specifically geared toward having the community itself develop a web app to develop a social program and spread the message. This same model can be repeated and utilized across municipalities, State Agencies and all manner of government offices not only making the jobs of government employees easier but also enabling the community itself to take a larger stock in the process and outcome of the governing process. The most interesting aspect of this article is the in the standardization of “the specification for the application programming interface for Open 311.” Many may recognize 311 as the non-emergency number for many cities and municipalities in Canada and the United States. Open 311 creates a standardized system for citizens to communicate with their local governments. This communication includes street repairs, power breakdowns, and other municipal service related issues. 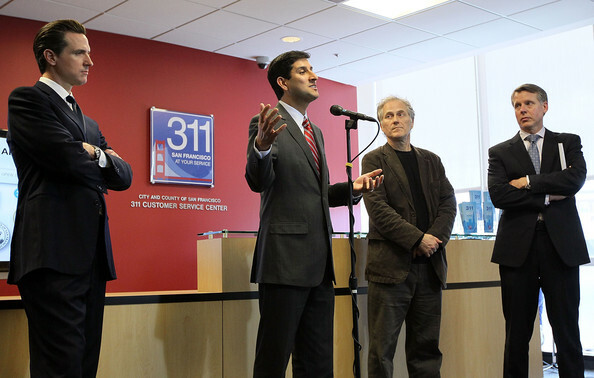 What Open 311 will do is, as Mashable points out, “developers across the nation can create applications that will work in any city that uses Open 311.” As in, if a developer creates an application that can work in San Francisco, it will work just as efficiently and effectively in Washington DC, and any future city to utilize Open 311. As a former San Jose City Council Legislative Aide and Community Service Representative I can recognize the importance of this. If there were a pothole in your neighborhood, for example, traditionally one would try and call the proper city office to report the problem or, in most cases, call their representative to report the problem. The representative’s office would then direct the issue as a task order to the proper department and have to continue to check in with said department before reporting back to the concerned citizen. With Open 311 and SeeClickFix (mentioned in the Mashable article) a community member, can instantly report the problem in a couple of simple steps from their smart phone cutting down city staff’s time on these issues and, in the long run, saving taxpayers money. Local and State Agencies, if they want to keep up with the trend of leveraging social media to deliver their services easier, need to develop and utilize these tools as they relate to their own departments. These tools should not be seen as an intrusion or something to be feared but a medium for communication and delivery of their services. Like any tool, social media and web 2.0 technologies exist to make their jobs easier. The Federal government has already begun to In January of 2009, President Obama issued a memorandum calling for an Open Government Initiative and, as a result, the Executive Office of the President released a Memorandum on Social Media and how it relates to the Paperwork Reduction Act (PRA). When the PRA was enacted in 1995, it required that federal agencies report and justify the gathering of information from the public, a process that took months. The President’s new memo recognizes that the nature of today’s internet-based capabilities (wikis, blogs, tweets, etc.) is collaborative, and makes it such that these internet-based capabilities do not trigger the PRA. It’s important to note that the memo applies whether interactions are occurring on a .gov site or on a third-party platform. This is the first step in creating a completely inclusive and collaborative government; eventually enabling the citizenry to have direct input on almost all internal and external policy of Federal Agencies. This will also eventually lead to a more cohesive system of public input and services delivery. New tools and applications are being invented and implemented all the time, there is a list of a few from 2008 on Mashable’s blog that are instantly interesting regarding their future ramifications. This is an exciting time for government outreach when tools that can fill almost any need are being developed constantly. I wonder what tomorrow will bring.